This is as nonfiction as fiction gets. About my fifth or sixth copy of this book, which should be read by everyone. Precisely the reason why I keep buying it and sending it out in the world. Why things are as they are, in our culture, and how to change our vision. Now the book has been tainted by an intimate encounter with a red cabbage. Nevertheless it is still a very important read. I will give it to Niana. Happy reading. This book is bound to zoom round my head for a while. Thank you, Biba! When something makes me angry, usually there's something 2 learn. It's been a week, & now i'm seeing proof of Quinn's point all over the place. Anyway, Ishmael & the documentary are both going to Papaver. I think she'll find it interesting! This Ish is back at home base. I will make sure it is being read soon again. This Ishmael copy was given to friend and fellow-bookcrosser Papaver, who wanted another friend to read it, too. And it has arrived back home again. I will read it now. ... but first it goes to bookcrosser Qimp, who apparently has been looking out for it. Thank you very much for lending me this book, biba! Looking out for it is maybe a bit strongly put (as I still have a pile TBR's which I'd like to get through before moving to the beautiful city of Deventer next month), but I have heard about this book before, and it did indeed sound interesting. I am looking forward to reading it! 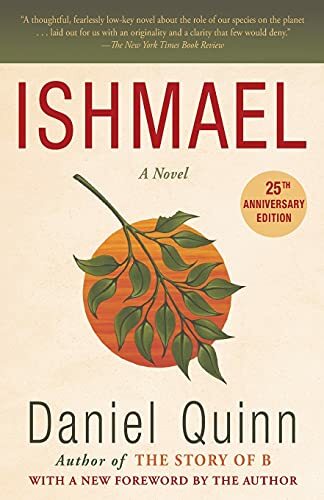 Finished reading Ishmael this morning. Thought provoking book. I will send you a PM, biba, about bringing the book back. Thanks a lot for lending it!